Violins are steeped in tradition. The Guarneri and Stradivarius violins of the 1700s are considered the Holy Grail of instruments. It’s not a bad thing to be in love with the past, but let’s face it: violins aren’t at the forefront of musical innovation. Enter Mari Kimura, a composer and professor at the Juilliard School. Over the past two decades, she’s found unusual ways to introduce her century-old violin to the computer age. Mari spent a year as a composer in residence at IRCAM, a research institution devoted to researching and designing novel ways to play music. Collaborating with Nicholas Rasamimanana and other engineers, she helped design a glove that fits snugly on her bowing hand. It may not produce a sound on its own, but its sensors feed data to her computer and trigger a variety of effects, ranging from interactive graphics to time manipulation. 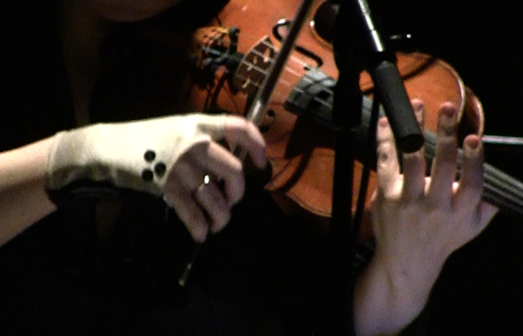 Mari composed a collection of solo pieces around this so-called augmented violin and performed them in concert at the Roulette concert hall in Brooklyn on October 9th, 2011, as seen — and more importantly heard — in this video.